A US scientist has had all his DNA screened for genes which predict the diseases he may develop in later life. 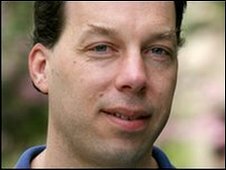 Stephen Quake's genetic profile was probed for genes linked to dozens of diseases, such as cancer and diabetes. The healthy 40-year-old was told he was at increased risk of heart attack, diabetes and some cancers. Scientists say the study, published in the Lancet, ushers in a new era of personalised medicine, but raises ethical dilemmas. Professor Quake received publicity last year when he used new technology to sequence his entire genetic code, or genome, for less than 50,000 US dollars (£33,000). This was a relatively cheap figure compared with early genome sequencing efforts. The professor of bioengineering volunteered to have his genetic map analysed for genetic "mistakes" and variations known to be associated with 55 conditions. They included a rare heart condition that appeared to run in the family. Before taking the test, he was given counselling to prepare him for the possibility that a serious disease could be uncovered. The results were mixed. They showed he has a much lower than expected risk of developing Alzheimer's disease in his lifetime. But he also has a much higher risk of developing obesity, diabetes and coronary heart disease. He also has rare genetic variations associated with sudden cardiac death. Professor Quake, of Stanford University, California, said: "It's certainly been interesting. I was curious to see what would show up. "But it's important to recognise that not everyone will want to know the intimate details of their genome, and it's entirely possible that this group will be the majority. "There are many ethical, educational and policy questions that need to be addressed going forward." The falling cost of genome sequencing is bringing us closer to the day when it is accessible to all. Some scientists believe similar genetic assessments could be offered by doctors in about a decade. Professor Henry Greely, from Stanford Law School, said doctors are about to be hit by a "tsunami" of genome sequence data. He said: "The experience with Steve Quake's genome shows we need to start thinking - hard and soon - about how we can deal with that information." More than 10 individuals have had their full genomes sequenced. Some have been analysed for genetic variations that are associated with certain diseases. And a number of companies offer genetic tests to assess the risk of a range of conditions without sequencing a person's full genome. But the Stanford team went further - honing in on Professor Quake's family history of heart problems. Dr Philippa Brice of the genetic think-tank Population Health Genomics told the BBC: "In the case of this specific example the research is not ground breaking. "Its significance lies in the way it illustrates the potential future of genomic medicine whereby doctors will be able to use this as a useful clinical approach."